Cat Food - How to choose? Cat foods are widely available in a truly amazing variety! 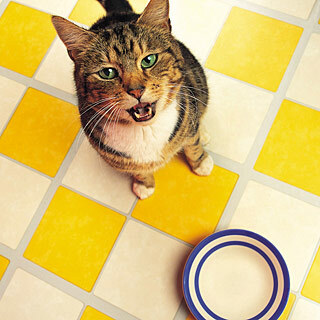 There are wet foods, dry foods, foods for every age and condition of cat. With all this diversity, it can be a confusing task, to pick the Best one for your cat. While it’s true that the majority of brand-name cat foods are primarily grain based, often containing large amounts of corn or rice, most are also supplemented with meats and minerals and vitamins. My recommendation? When choosing a dry food, be sure to look at the ingredients, and find one with meat (Not meat by-products) as one of the first three ingredients. Ingredients are listed in the order of predominance in the food, so if meat is in the top two or three, you will be buying a meat based food and that’s a great start. Look for premium foods to have the most meat content, since it is more expensive to make food with real meat as opposed to grain and meat by products. In many cases, your cat may have special needs, or dietary restrictions for his own health’s sake. Two of these conditions are discussed in my Diabetic and UT Foods page,along with variations of my basic cat food recipe for UT prone cats on my Cat Food Recipes page. Of course, you can always make your cat’s food, and that is a fine choice if you have the time and inclination. Finding a good recipe is sometimes problematic, given our feline friends dietary needs, but I have created a page with my very own secret (well, not anymore)cat food recipes. If you are concerned with preservatives or additives which may be harmful to your cat, please consider looking at my page on Natural Cat Foods. Here is where you will find helpful information on the vast selection of natural foods on the market today. When in doubt, consulting with your veterinarian’s office is always a wise choice. Your veterinarian can also tell you if your cat needs any vitamin supplements. I have gathered some information on this subject for you on my Cat Vitamin page. As always though, remember that I am but a humble Cat Lady, and as experienced as I am, your veterinarian’s opinion should always be heeded. Canned feline foods are very nice, and some can provide all the nutrition your cat needs. Follow the suggestions above and seek a meat based food (believe it or not some canned cat foods are not mostly meat! - Sneaky manufacturers!) and again, when in doubt, ask your vet. Also, please provide some crunch in your cat’s diet. It helps keep the teeth clean and in good condition, and cats love the feel of crunching something up in their teeth. So says my cat Spooky anyway! While we're on the subject of crunchy, This seems like a good time to discuss treats. Cat treats are not necessary to the good health of your cat. They are very useful in bonding with and training your cat. Many varieties are available, and most are very good for your cat, often employing the use of herbs, oils and vitamin supplements to make the treats actually good for kitty! Find out more about how to choose the best cat treats with a visit to my Cat-Treats page. Cats have been known to develop a fondness for "people food”, including chicken, popcicles, French fries, pizza, olive oil, ice cream, oranges, olives, tomato soup, and soda as well as the really weird stuff like as corn and melon. It may be ok to indulge your cat once in a while, but please exercise moderation in sharing people food with your cat. Too many unorthodox treats can lead to obesity and you need to know that many "people foods" are not good for cats; chocolate, for example, can be fatal due to the presence of theobromine. Onions and garlic are also bad for cats. While we are on the subject, please remember that many common household plants are highly toxic to cats! Lilies, Philodendrons, Poinsettias and many others can be deadly to your feline friend. Please have a look at my page on Cat-Toxic and Cat-Safe plants before putting any vegetation into your cat’s environment. View the list of Cat-Safe plants here! I hope that this has been helpful in getting to know more about the foods available for your cat, and helpful in your choice of what to feed to your best friend. When you stop to think about it, the most important things domesticated cats get out of life is who they’re with and what they eat. Let’s strive to give them the very best of both.